And the top award goes to ... Hulu? Hulu, the underdog of the streaming TV wars, just beat out Netflix and Amazon for TV's top prize. Hulu's "The Handmaid's Tale's" made history Sunday as the first streaming service series to win the Emmy for outstanding drama. Networks like HBO and, more recently, Internet players like Netflix vie for the prize every year. Netflix had three dramas nominated on Sunday -- "The Crown," "House of Cards" and "Stranger Things" -- but "The Handmaid's Tale" won acclaim from Emmy voters. Hulu executives were ecstatic. Immediately after the awards telecast, Hulu CEO Mike Hopkins celebrated with the cast and producers. "This is an incredible night for Hulu and 'The Handmaid's Tale,'" Hopkins told CNNMoney via email from backstage. "We're so proud and grateful that this groundbreaking story has made Emmys history!" All told, "The Handmaid's Tale" won five Emmys on Sunday night and picked up three more at the Creative Arts Emmy Awards ceremony last week. This was the drama's first season, which makes the sheer number of wins even more remarkable. Hulu ordered a second season of the show back in May. On Sunday night Elisabeth Moss won the award for lead actress in a drama and Ann Dowd won in the supporting actress category. The show was also honored for writing, directing and cinematography. The drama's stars and producers celebrated at a late-night bash hosted by Hulu in Los Angeles. The streaming service evidently picked the right year to start throwing an Emmys party. 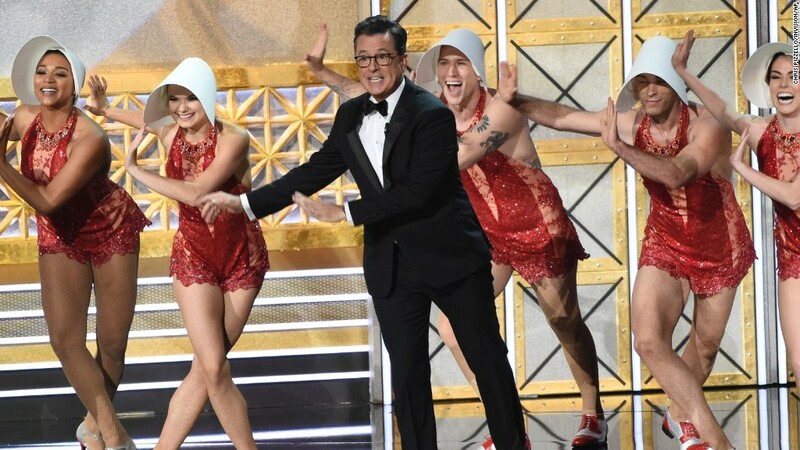 The Emmys are as self-congratulatory as anything in Hollywood. But the awards matter, at least a little bit, because they secure bragging rights and industry-wide recognition. Winners always hope that the awards and the news media attention will encourage new viewers to sample their shows. For Hulu, there's also an opportunity to convert viewers to paying subscribers. Overall, this year's Emmys demonstrated the ongoing competition between traditional TV networks (which now have streaming options) and newer streaming services. HBO finished Emmys season with 29 Emmy statues, leading the pack for the 17th consecutive year. Netflix picked up 20, NBC had 15, and Hulu had 10. Hulu has millions of fans, but it's much smaller than Netflix. The company launched in 2008 as a platform for catching up on shows that had already aired on NBC, Fox and other networks. The company's evolution mirrors the dramatic changes that have happened in the TV business since then. Hulu is now a joint venture between four big media companies -- 21st Century Fox, Disney, Comcast, and Time Warner. (CNN is a unit of Time Warner.) It still carries shows from other networks, but it is prioritizing its original shows, like "The Handmaid's Tale," "Casual," and "Difficult People." The company is also promoting its paid subscriptions, which give users full access to shows, and a new live TV option, which mimics the cable bundle. Hulu oftentimes finds itself in the shadow of Netflix and Amazon. Netflix was seen as a party-crasher back in 2013 when "House of Cards" was nominated for multiple Emmys. But now, in 2017, it's presumed that the streaming services will compete in virtually every major Emmys category with the traditional TV networks. What a difference a few years makes.